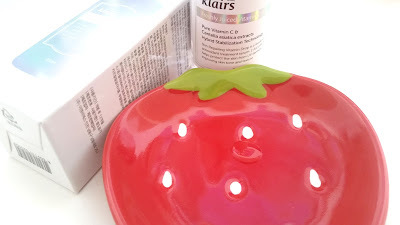 Today, I thought I'd share my first impressions and mini review on the Klairs Freshly Juiced Vitamin Drop. This is the Vitamin C serum I am currently testing and have been testing for the past 2 weeks. I started my journey with the C21.5 Vitamin C serum early this year to help lighten my post acne marks. It worked well and I have a second bottle of it saved up. The Klairs Freshly Juiced Vitamin Drop is less potent than the C21.5. At only 5% it seems way less compared to C21.5's 21.5%. However, I wanted to try it out anyways because it promises to be non-irritating on the skin, even for those with sensitive skin like me. I wanted to see how well the Klairs Vitamin Drop would work for my skin and how it will compare to the C21.5. Product Description: A Vitamin C serum created to energize and rejuvenate the skin. 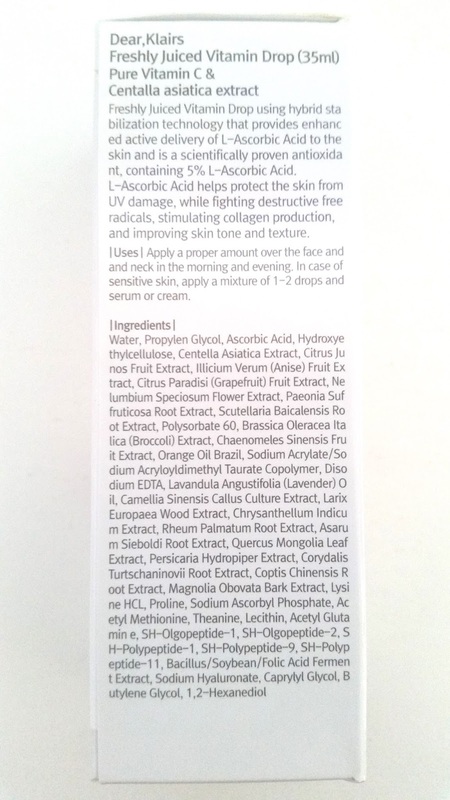 The serum contains 5% ascorbic acid and various botanic extracts to help care for the skin without irritating it. Vitamin C is known as an antioxidant that can help brighten the skin while providing anti-aging care to it. It's also know to help lighten skin pigmentation and post acne marks as well. To Use: Cleanse the skin first. Apply a couple of drops of the serum to the entire face. Gently spread and massage the serum into the skin. Wait a bit for the serum to work before applying the rest of the skincare routine. Ingredients: Water, Propylen Glycol, Ascorbic Acid (5%), Hydroxyethylcellulose, Centella Asiatica Extract, Citrus Junos Fruit Extract, Illicium Verum(Anise) Fruit Extract, Citrus Paradisi(Grapefruit) Fruit Extract, Nelumbium Speciosum Flower Extract, Paeonia Suffruticosa Root Extract, Scutellaria Baicalensis Root Extract, Polysorbate 60, Brassica Oleracea Italica (Broccoli) Extract, Chaenomeles Sinensis Fruit Extract, Orange Oil Brazil, Sodium Acrylate/Sodium Acryloyldimethyl Taurate Copolymer, Disodium EDTA, Lavandula Angustifolia (Lavender) Oil, Camellia Sinensis Callus Culture Extract, Larix Europaea Wood Extract, Chrysanthellum Indicum Extract, Rheum Palmatum Root Extract, Asarum Sieboldi Root Extract, Quercus Mongolia Leaf Extract, Persicaria Hydropiper Extract, Corydalis Turtschaninovii Root Extract, Coptis Chinensis Root Extract, Magnolia Obovata Bark Extract, Lysine HCL, Proline, Sodium Ascorbyl Phosphate, Acetyl Methionine, Theanine, Lecithin, Acetyl Glutamine,SH-Olgopeptide-1, SH-Olgopeptide-2, SH-Polypeptide-1, SH-Polypeptide-9, SH-Polypeptide-11, Bacillus/Soybean/Folic Acid Ferment Extract, Sodium Hyaluronate, Caprylyl Glycol, Butylene Glycol, 1,2-Hexanediol. 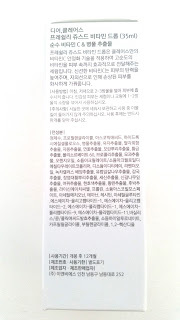 Please Do Not use if: you are sensitive to any of its ingredients. 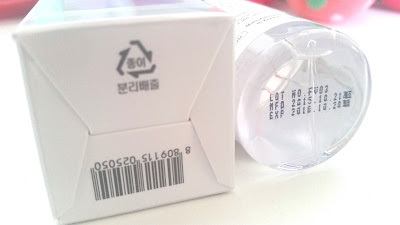 Packaging: I was a bit surprised by the packaging for this serum. 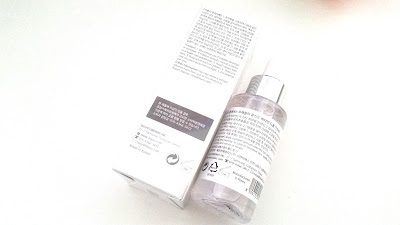 Unlike most Vitamin C serums which comes in a darker container, this one came in a clear bottle. Its materials did not match the simple and chic designs. The serum bottle is made out of plastic instead of glass. So while the design is sleek and chic, the plastic made it feel a bit cheap. However, the good thing about it being plastic is that, if I drop it, it won't break easily. 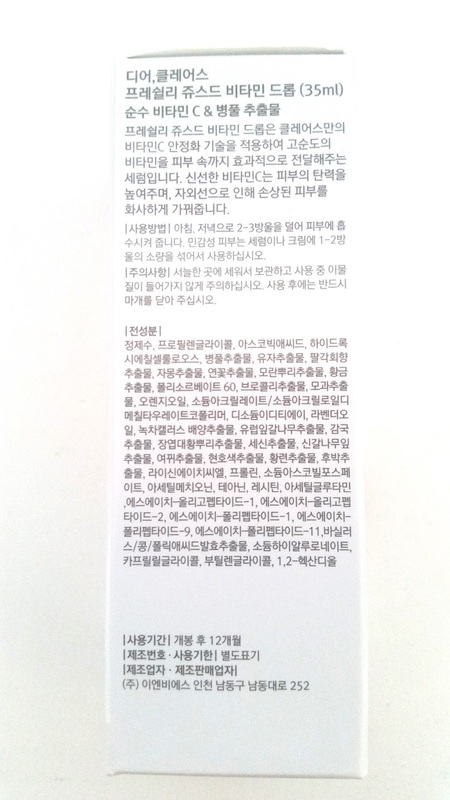 I like that the outer box packaging came with instructions and ingredients in both Korean and English (see pictures below). It's so convenient this way. Like most Vitamin C serums, this came with a dropper, which is convenient. Scent: There's a faint scent to this serum. I'm glad it's light though because it's not a scent that I like. Simply put, it smells like sour plastic. Like lemon juice that's been sitting in a plastic bottle under the sun for way too long. The good thing though is that the scent is light and disappears quickly once applied to the face. Texture: The serums is liquidy like most serums, however, it feels oily when applied. I thought that was interesting. Although it is oily, it does not feel greasy when applied. It apples on nicely and absorbs quickly as well. It can leave a light shine on the skin but that disappears over time. Color: The serum is clear in color. Although, as with most Vitamin C serums, its color can change over time due to oxidation. So, it's best to store it in a dark and cool place away from direct sunlight. It's good to note that if the serum turns to a dark orange color, it's probably best to stop using. As that means it has oxidized. My Thoughts: I have been patch testing the Klairs Vitamin Drop and I've gotten some interesting results. Unlike the C21.5 which I meticulously tested because it caused stingy feelings in the beginning. The Vitamin Drop didn't cause that issue. So I was able to move it on to full face tests much faster than expected. I am also able to use the Vitamin Drop morning and night right now, something I cannot do with the C21.5, as it would be too much for my skin. I think this would have been a great Vitamin C serum for me to start out with as it is less irritating and my sensitive skin can easily get used to it. However, now that I have tried the C21.5 (and got my skin used to it), this Vitamin Drop makes me feel like I'm going backwards. Its vitamin C content is not as potent, so it would take a much longer time for it to become effective. Since I started to use the Klairs Vitamin Drop, I have noticed that my face feels a bit more plump. It also helps with redness a bit but that's kind of it. I haven't noticed much of a brightening effect. It also hasn't done anything to my post acne marks. I wonder how long it would take before it makes any noticeable effects. On a plus side, the Vitamin Drop hasn't made my nails orange. This was a small issue with the C21.5 as it did make 1 of my nails a bit orange, even though I wash my hands every time after I use the serum. That orangeness disappeared during my break from the C21.5. The Vitamin Drop promotes itself as a product with a hybrid stabilization technology that helps the Vitamin C to last longer. That sounds fantastic, (I wonder if it works) because one of my biggest fears with the C21.5 is that it would go bad before I could finish it. However, it is a bit odd that the Vitamin Drop came in a clear bottle. Usually Vitamin C serums are stored in a dark bottle to help keep it from light. So I wonder if the clear bottle would affect its storage life. My serum is currently being stored in a cool and dark place, so I'll have to test this out and see how long the Vitamin Drop will last. Final Thoughts: I knew that with Klairs Vitamin Drop's low vitamin C content that the potential effectiveness would be less. However, I still wished for more than what I got. I think this would be a good serum for someone with sensitive skin and wants to try Vitamin C for the first time. However, for those who have used other Vitamin C serums with higher content, this might feel like a step backwards. 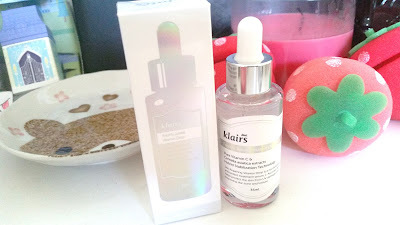 I think I will keep on using this Vitamin Drop serum until I finish it before writing a full review on it. I do hope by the time I finish the bottle, I'll see more results than what I have seen so far. Would I purchase it in the future? That's still undecided, but currently leaning towards the probably not side. If the serum does not show any results by the time I finish it, then I probably won't purchase. If it does show some good results, I might reconsider. Do I think this Klairs Freshly Juiced Vitamin Drop is worth a try? Well, that depends on you and your skin. If you have sensitive skin, has never tried a Vitamin C serum, and wants to start slow so you don't irritate your skin then this Vitamin Drop would be a good option. If you have used Vitamin C before and a at higher % than this one, then the Vitamin Drop might not feel as effective for you. Check out our Deals Page for discount codes to use towards your purchase! Disclaimer: This product was sent to me for review purposes, however, all opinions are honest and my own. I was not compensated in any other way. 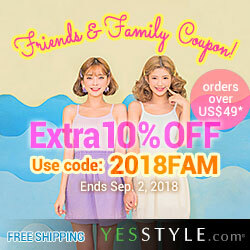 This post contains affiliate link, our full disclaimer here.